I’ve been fascinated by volcanoes for as long as I can remember. Growing up, I would pore over coffee table books about the eruption of Mt. St. Helens, read storybooks about Parícutin (the Mexican volcano that formed in somebody’s backyard in the ‘40s), and marvel at my mom’s Ziploc bag of ash from Mt. St. Helens that my great-uncle collected in Spokane, Washington. My favorite culture chapter in my elementary Latin textbook had to do with the devastating eruption of Vesuvius that wiped Pompeii off the map. Life in flat, flat Dallas—almost entirely geologically inactive—left much to be desired. So it shouldn’t be surprising that Crater Lake National Park has long been on my to-visit list, an eerie lake that formed after a volcano fell in on itself 7,700 years ago. The caldera holds America’s deepest lake, but it’s also home to satisfying hikes and stunning views, especially of the beguiling Wizard Island. I tried to make a daytrip to Crater Lake from Bend, Oregon, last September—but, sadly, raging forest fires from 2017’s horrendous season forced authorities to shut down the highway south due to smoke. Even if the roads had been open, I wouldn’t have been able to see anything on the crater rim. My friend Jonathan, who I was staying with in Bend, and I came up with a Plan B: Newberry National Volcanic Monument. 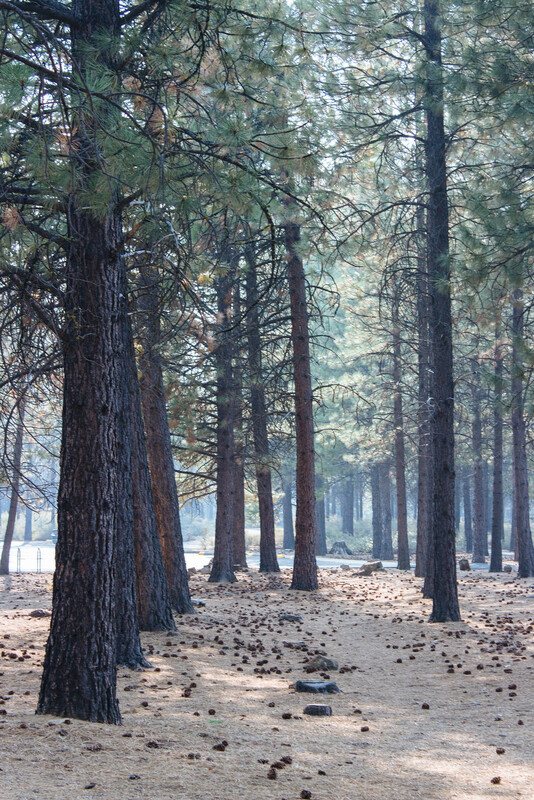 One of the few national parks administered by the U.S. Forest Service, Newberry NVM is just a 20-minute drive outside of town—far more attractive than the 2-hour drive to get to Crater Lake. 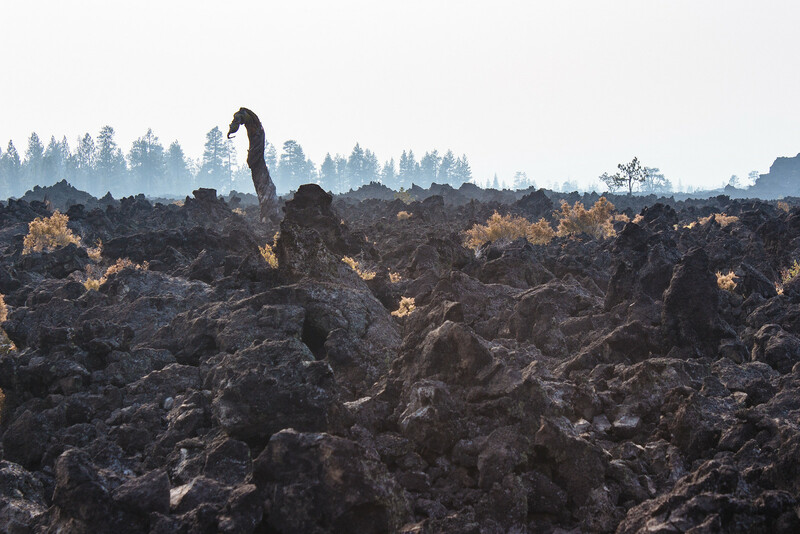 Not only did I get my volcano fix in here, between a cinder cone and lava fields, I also got to explore a lava tube and get up close and personal with the ecosystem of central Oregon. We pulled off into a parking lot on the side of the highway. Once we entered the park, we found a crevice that opened into an underground tube that would have served as a pipeline for lava rushing to an eruption. On the surface, the smoky air irritated our throats and the late-summer warmth kept things at a toasty 90º F. But as we headed deep into the Lava River Tube, the weather changed almost immediately, dropping thirty degrees and shifting to clean, humid air. We had to make do with our own headlamps and flashlights, which meant should their batteries have died, we would have been lost in total darkness. Yikes! The lava tube was different from limestone caves I’ve visited before; instead of stalactites, stalagmites, and spooky rock formations, the cave featured long, smooth walls and was consistently the size of a double-tracked subway tunnel for the whole length of the cave. Were it not for the group in front of us with their flashlights or the family behind us with loud children, the lava tube would have been a cool, meditative escape from life on the surface world. There’s so much more to Newberry NVM than just this pull-off on U.S. Highway 97 that my friend Jonathan and I visited, just a sliver of what the U.S. Geological Survey calls the Northwest Rift Zone. In fact, there’s an entire caldera to the southeast with two lakes, a growing cone, and lava flows galore. I learned that Newberry Volcano is the largest volcano in the Cascades, a shield-shaped stratovolcano larger than the state of Rhode Island—and an active volcano at that! 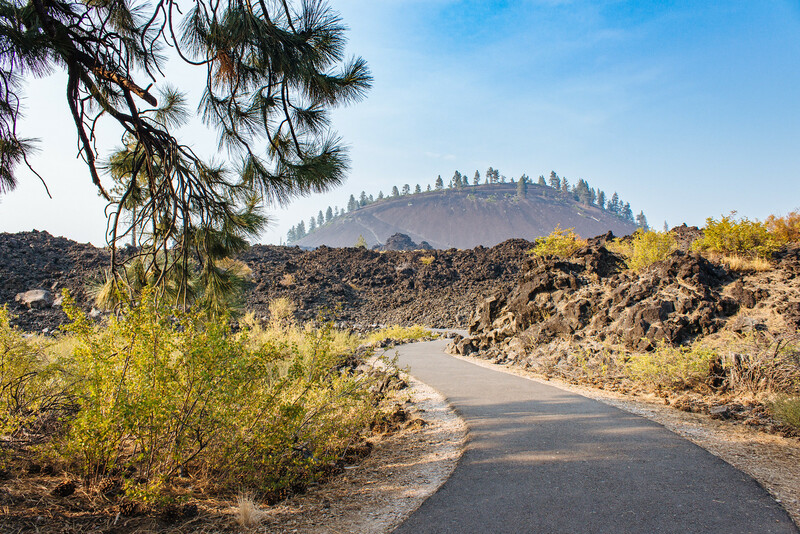 We didn’t have enough time to drive deep into the forest and explore said lakes and lava flows, but fortunately right outside the visitor center looms a substantial cinder cone called Lava Butte. We missed the last shuttle bus taking folks to the summit, but nevertheless still had plenty to explore. Winding trails took us deep into the lava field at the foot of the butte, which was formed by a stray eruption related to Newberry Volcano 20 miles to the south. 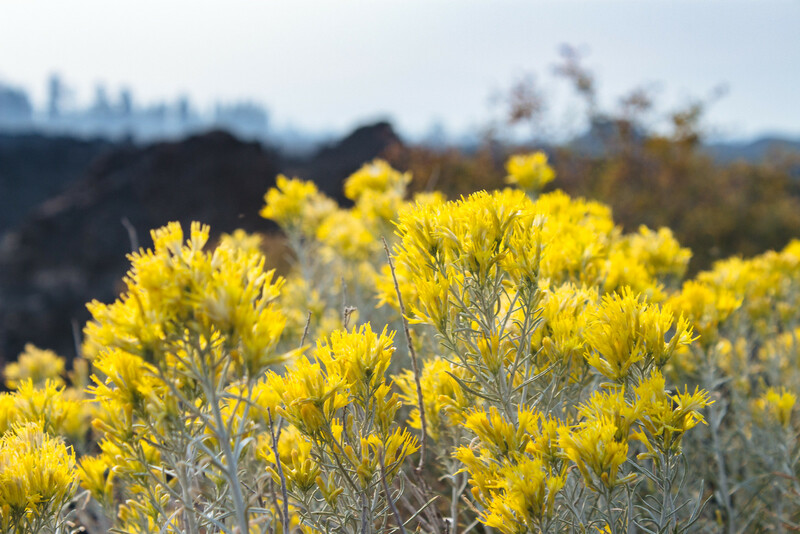 Wandering through the rugged, almost-lifeless pumice field made me feel like I had set foot on another planet, and plant life new to me like rabbitbrush, oh-so common in the high desert, felt alien to me. 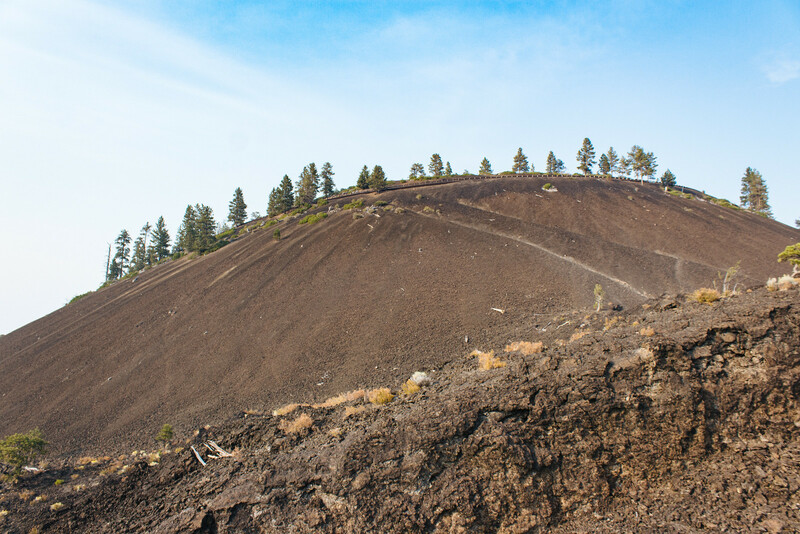 The trail dead-ended nearly halfway up the butte, giving us spectacular views of the surrounding area: vast woods that support the region’s logging economy, a lava field peppered by colonizing Ponderosa pines, and gray-blue smoke drifting in from far-off forest fires. The Lava River Cave is located off exit 157 on U.S. Highway 97 about 20 minutes south of Bend and is open May through September. The Lava Lands Visitor Center is just a mile north of the Lava River Cave on Cottonwood Road on the other side of US-97 via an underpass. The visitor center—and access to the top of the butte—is also open May through September, but the parking lot is available year round. Have you been inside a lava tube before? What’s your favorite volcano you’ve been to? Share your experiences down in the comments section!